3x4" Cotton Bags are made from 5 oz cotton with 100% cotton cord drawstrings. Cotton drawstring pouches are perfect for jewelry, soaps, cosmetics, gift cards and so much more! Our small cotton pouches can be used for party favor gifts or wedding favor bags. These bags are easy to stamp with ink for fun and festive designs! 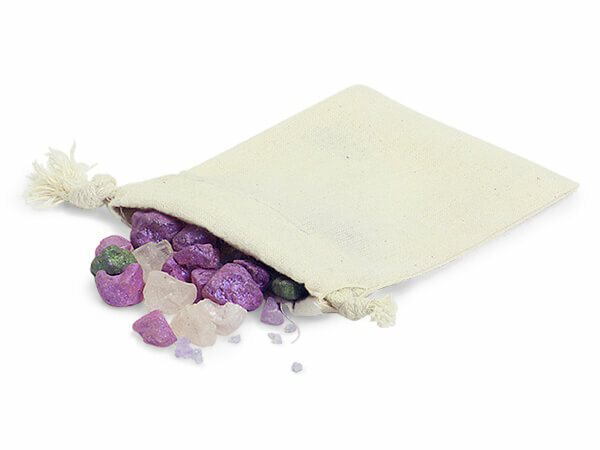 The medium sized pouches are great for bigger items like candles, lotions and bath and body products. Use the round bottom bag for an easy standing display! Use the larger sizes for wine bottles, photo albums or books.